Cradle of Filth is currently in the middle of one of the best phases of their career, blending several genres with their trademark gothic atmosphere so effectively that it sounds deceptively simple in its execution. Why See Cradle of Filth? Vigorous heavy metal band Cradle of Filth first came onto the scene in 1991 and have made a name for themselves through intense sounds and dynamic visuals ever since. Going through a musical journey that included black, gothic, and symphonic metal, today the band's sound is unique and recognised, putting them at the cutting edge of metal. Since their memorable debut album The Principle Of Evil Made Flesh, the band have been known for being influenced by Gothicism, horror, and literature. They have also gone through many line up changes, before settling on guitarists Richard Shaw and Ashok, Daniel Firth on bass, Martin Skaroupka on drums and keyboards, and Lindsay Schoolcraft on narrative vocals, who make up the band today. 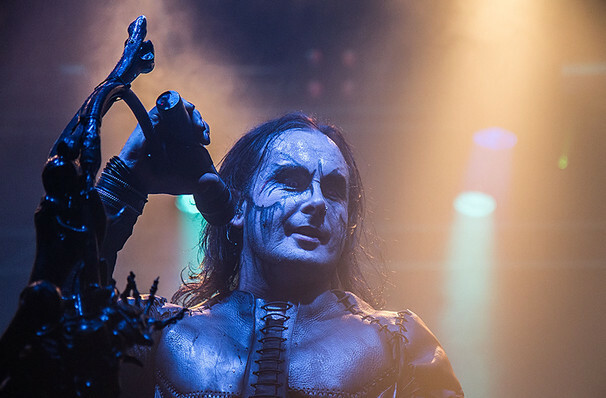 Dani Filth is the last surviving original member, and leads the band with powerful and enigmatic vocals. Seen Cradle of Filth? Loved it? Hated it? Sound good to you? Share this page on social media and let your friends know about Cradle of Filth at House of Blues.